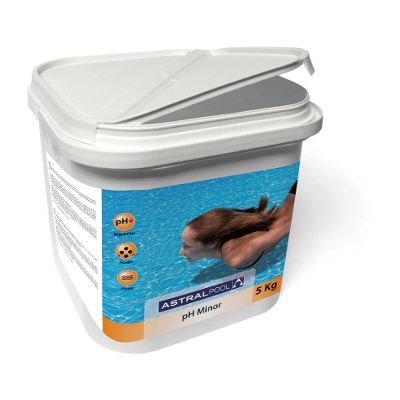 AstralPool Solid pH Minus 8kg. For adjusting pH between 7.2 and 7.6. Granulated compound which reduces the pH level of the water when it is greater than 7,6. It is essential forproper water treatment, ensuring that bather’s skin is not irritated by a pH imbalance. Add 1.5Kg of 010 to reduce 0.2 pH units by 100 m3 volume of water. This dose is meant as a guideline. The perfect pH balance should be between 7.2 – 7.6. The pH level is easily determined by using a pH and chlorine test kid and should be carried out twice daily. Pour the necessary dose in a container with water and pour the mixture evenly over the surface of the pool.